Since we’re in the midst of our fifth-issue Kickstarter, it seems appropriate to share some of the poems we wrote for last issue’s Kickstarter backers. Today we’re sharing haiku; next time we’ll share some of the glosas. All poems written for Kickstarter backers are by editors of The Quilliad (who also happen to be published poets). Topics are chosen by our backers. 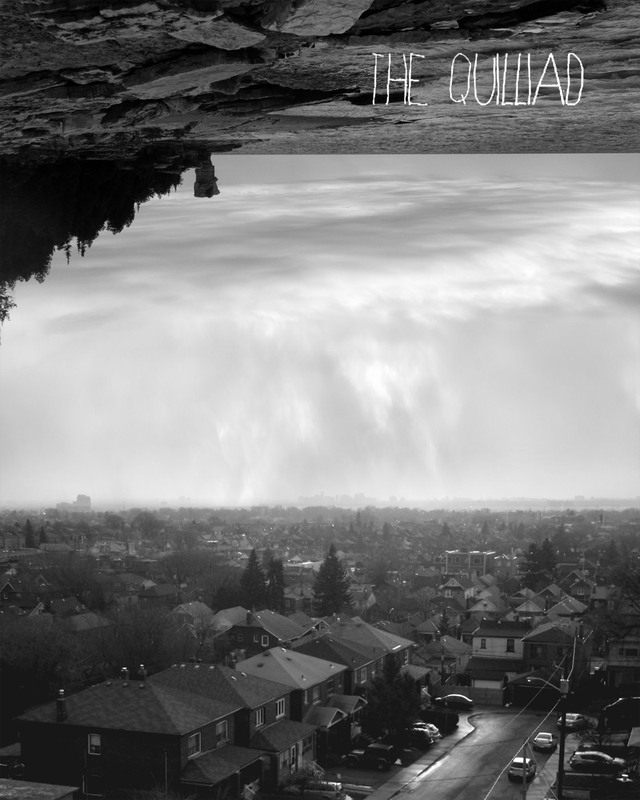 The Quilliad is a biannual literary and arts journal that publishes short fiction, poetry, paintings, illustrations, comics, and photography by Canadian writers and artists. If you’d like to support The Quilliad (or if you’d just like to have poetry written for you on the topic of your choice), check out our fifth-issue Kickstarter. We’re also offering art prints, pinback buttons, and copies of the journal. With our fifth issue Kickstarter and submission call running concurrently until March 22, we find ourselves here at The Quilliad thinking about how far we’ve come. Our publication started as a club chapbook for the University Heights Literary Society at York. We never received funding for The Quilliad from our university and thus were an independent publication from the start. The original team pooled its funds and had 200 copies of our first issue printed by Biz Shoppe, a fantastic printer up Yonge Street in Toronto, discovered by the literary society’s founder, Devin Edwards. You can read a free digital version of our first issue here. Most of us graduated from York that year, and the University Heights Literary Society disbanded after four years of meeting to write and critique each others’ work, but it inspired us to keep writing–and editing. A smaller but no less committed team of editors, including myself as editor-in-chief, continued publishing The Quilliad. We have been lucky enough to work with some amazingly talented writers and artists, among them our second- and third-issue cover photographer Sean G. Marjoram and our fourth-issue cover photographer Scott Williams. We’ve also had the pleasure to work with the spooky Dan Holst Soelberg and featured the detailed work of Melissa Crook. Many of our classmates from the York creative writing program have graced our pages, but so have authors from across Canada–never-before-published writers from universities across the country, emerging talents like Kayla Czaga, and poets well-known in the Toronto poetry scene, like Lizzie Violet and Phlip Arima. With each issue, we find contributors in more surprising places. Our fourth issue was our first Halloween issue, focussing on literary horror and art, apocalyptic poetry, and science fiction. We hope to continue the tradition every October. Our fifth issue has no theme–we’re open to short stories, flash fiction, poetry, paintings, illustrations, comics, and photography on any subject. If you’re interested in submitting to us, please read our submission guidelines and send your work to thequilliad@gmail.com. Our success is largely due to the support we’ve found in the Toronto literary scene and through Kickstarter. If you are interested in supporting our fifth issue, see our Kickstarter campaign page. We’re offering some great rewards, including poetry on demand, art prints, pinback buttons, and, of course, copies of The Quilliad. Thank you to those who have supported us thus far. We are excited about out fifth issue and the start of our third year in print. All watermarks will be removed from artwork for printing. We’re also offering copies of The Quilliad and poetry on demand. If you’re interested in short fiction, poetry, and art, check out our Kickstarter campaign for our fifth issue. If you’re a Canadian writer or artist, check out our submissions guidelines. We’re open to submissions until March 22. Fifth Issue Update: Submissions and Kickstarter Rewards! For those who don’t know about us, The Quilliad is a literature and arts journal focussing on writing and art by Canadian authors and visual artists (including photographers, illustrators, comic artists, and more). We welcome submissions of everything from sonnets to literary science fiction. We’re proud to say that we pay our contributors and that we take pride in creating a beautiful, professional print issue every 6 months or so. We are currently in the midst of both our Kickstarter campaign and our submission call, so if you have something to send us, check out our submissions page for guidelines and send your work to thequilliad@gmail.com. We’re happy to say that we will be featuring the artwork of Eden Bachelder in our pages this issue, and there’s still room for more beautiful art. We’ve also received some great writing–let us see yours! Our Kickstarter is off to a good start, but there’s still a long way to go. If you love short fiction, poetry, art, and photography, check out our Kickstarter. Please share this post and help us get the word out–every cent we earn means a more beautiful publication and more money for our contributors. In addition to the poems, artwork, and copies of The Quilliad already available to backers, we’ll be adding new rewards over the course of the campaign to keep things interesting. Our fifth-issue Kickstarter has launched! 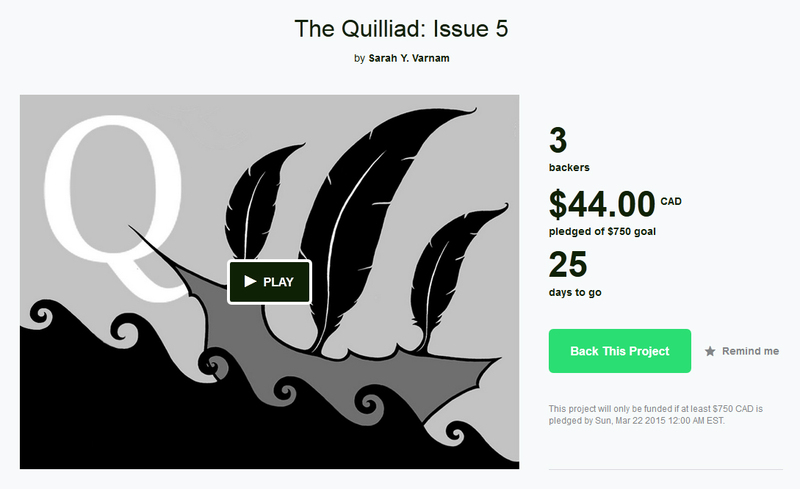 The Quilliad is excited to announce that our fifth-issue Kickstarter campaign is up and running as of a couple of minutes ago! We’re excited about this issue’s possibilities, so check out our video and share! Also be sure to keep an eye out for our submissions call, which should be up very soon! We’ll be looking for short stories, flash fiction, poetry, visual art, photography, and more from Canadian writers and artists. The Quilliad is open for submissions! Fiction! Poetry! Art! Send it all! As promised, with the start of The Quilliad‘s fifth-issue Kickstarter campaign comes the beginning of our submission call. We are interested in short stories, flash fiction, poetry, visual art, photography, comics, and more from Canadian writers and artists. Please see our submissions page for submission guidelines. We’re open to a variety of forms, including everything from literary science fiction to sonnets (and our submissions editor Steph would love to see some comics!). Email your submissions to thequilliad@gmail.com by March 22.